DotA 6.75 Fatal Error Problem. I don't know if this only happen to me, but whenever i'm trying to play DotA 6.75 in the Single Mode, i always got Fatal Error whenever i started attack the enemy. After trying to find out what's going wrong, it seems you must update your patch into Warcraft 1.26a. I got the Fatal Error when i'm using the Warcraft 1.24b. After i changed the patch, it's not happen again. 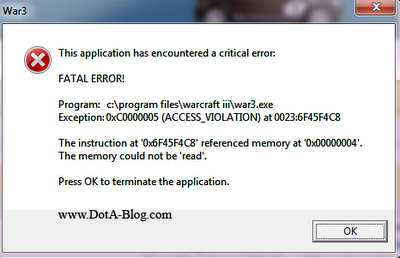 So, if you got Fatal Error, for the time being, try to switch your patch into Warcraft 1.26a. I already mention this problem to IceFrog and hopefully he can find the cause because some country still using the old patch as their main patch. If you also got this problem, please mention what patch you're having, your the Windows version and what are you doing when its happen, maybe it can help IceFrog fix this problem. Cheers! Update: This problem already fixed in the DotA 6.75b! Enjoy! Yeah, maybe the problem is on the 1.24b patch. how to change from 1.24 to 1.26 ? can you tell me how to do that ? Hey, when I play, the other heroes dont come out. Many thanks for the information you gave about this error.